Sterling Silver Feather Pendant Necklace on Rope Chain, "White Feather"
Desi Antari in Bali presents a pendant necklace of extraordinary beauty. 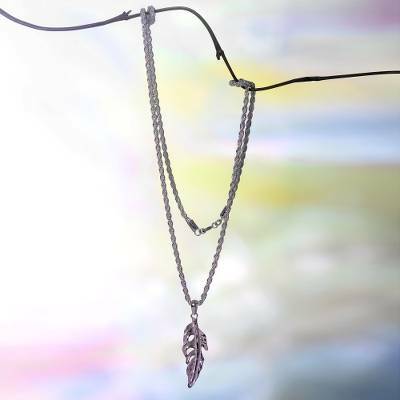 A deeply detailed feather in sterling silver is suspended on a delicate rope chain. The feather pendant features contrasting polished and sandblasted finishes; the sandblasted areas appear to be a frosty white. You can find sterling silver pendant necklace 'White Feather' by Desi Antari in jewelry categories such as No Stone Necklaces, Silver Necklaces, Sterling Silver Necklaces and Pendant Necklaces. Enjoy exploring these sections for other Novica treasures.